ABSTRACT: The automotive industry is undergoing significant technology and business model evolution – 2017 represented a year where several Auto OEMs launched initiatives focused on alternatives to vehicle purchasing and leasing: vehicle subscriptions. This new business model is intended to attract new customers who value convenience, low commitment, and optionality. Additionally, this move highlights potential OEM interest in building fleet management capabilities to position themselves favorably as they continue exploring new business / mobility models. The automotive ecosystem is in the midst of a technology revolution which is poised to fundamentally alter how customers evaluate car ownership. Auto incumbents – particularly OEMs – are seeking to mitigate risks in light of these looming threats. Incumbents have invested in technologies to enable autonomous vehicles, developed new mobility services offerings (i.e., ride / car sharing), and are exploring ownership alternatives to cater to shifting customer preferences / demographics. Vehicle subscription offerings have emerged as a potential ownership alternative that OEMs are exploring – however, significant challenges exist: appeasing the historic dealership channel, building a new channel to market, and developing fleet management capabilities. Vehicle subscriptions represent an emerging business model, with early initiatives by startups like Breeze (now Canvas) in 2013, and a notable uptick of OEM initiatives materializing in 2017, starting with Cadillac’s Book offering. Subscription models are designed to be a convenient alternative to leasing; in a subscription model, customers pay an “all-in” monthly fee including vehicle access, insurance, maintenance / servicing (and potentially roadside assistance) with gas representing the only incremental consumer expense. Additionally, there are variations of this model, such as Audi’s shorter-term rental option where customers pay a daily rate for vehicles. 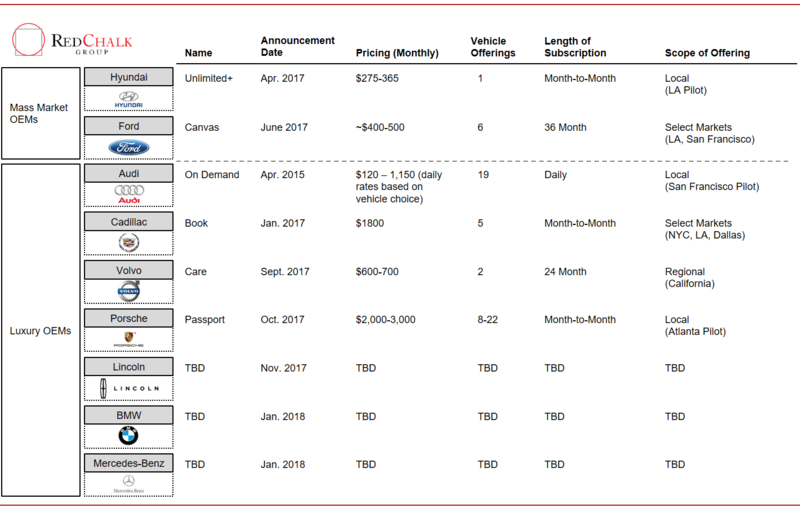 A range of OEMs have introduced subscription programs, which vary in terms of vehicle options, pricing, and term length (see Figure 1). Vehicle subscriptions are intended to attract customers who may not represent conventional customer profiles for OEMs. For example, several luxury OEMs are testing subscriptions to broaden customer exposure and target non-traditional customer segments (e.g., Millennials). Several trends are changing the nature of millennial vehicle ownership (e.g., monetary concerns, increased usage of ride-sharing) and delaying their first car purchase. Surveys indicate that the primary reason millennials are opting to delay major purchases (i.e., car, home) is elevated levels of monetary burden (e.g., student debt) and the top reason young millennials forgo buying a car is that [they] “can’t afford it”. The subscription model allows customers to avoid the upfront capital requirements and long-term contracts associated with buying or leasing, while adding convenience and flexibility with the “all-in” monthly fee and commitment. This new ownership model may help OEMs stay relevant and attract new customers but raises several new challenges as well. The subscription ownership model is meant to lower the barriers to consumer relationships with OEMs and build a direct to consumer channel to market, but OEMs may find it challenging due to potential pushback from the dealership channel. 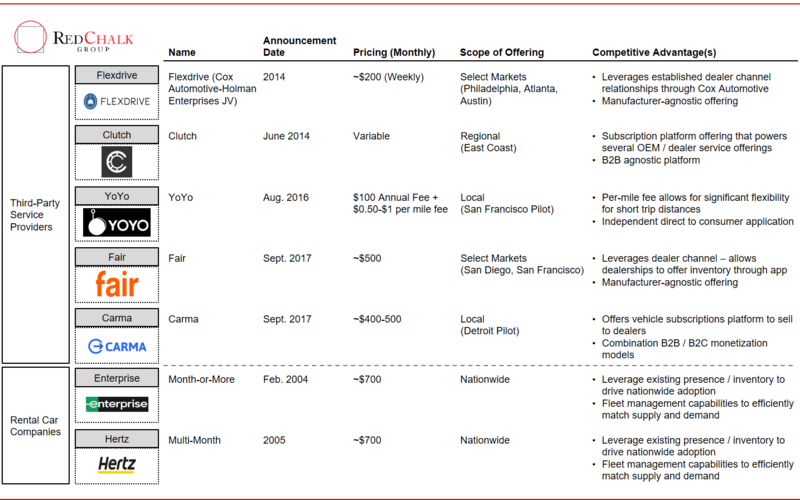 While most OEMs are currently piloting these programs in select markets, they will need to leverage their dealership network to effectively scale, which may upset the dealers who pay close attention to inventory and lot management, and view space that is not being actively monetized as lost revenue (sans a revenue share or cost offset). Additionally, despite its intention to attract new, incremental customers to the brand, subscription models could alter purchasing decisions for the traditional customer base, effectively cannibalizing new car sales and placing pressure on the dealer network. Moreover, OEMs may struggle managing the complexities of building a new business model, channel to market, and fleet while balancing a legacy operating model. Vehicle subscription models require a stock of cars from which customers choose; thus, this model necessitates development of fleet management capabilities. OEMs have traditionally not participated in fleet ownership / operation, and may struggle managing the complexities of fleet composition, vehicle churn, and maintenance / servicing issues. For companies that have traditionally relinquished servicing / customer support responsibilities to their channel partners, building the requisite capabilities may be a long and costly process. Some of these issues can be mitigated if the dealer channel can be brought on as partners, but, as mentioned, would likely require economic incentives for dealerships. Additionally, OEMs will need to dedicate some of the vehicles they produce to building a fleet versus selling / leasing these vehicles, which will require upfront capital commitments. Despite these challenges, OEMs can gain valuable capabilities in fleet management and pilot B2C offerings that can aid them as they explore other recurring / service models (e.g., car sharing). Subscription models are expected to see consumer uptake over the next 5 years, which should attract a large range of players (OEM and other third parties) and introduce additional variability in offerings as players adjust to evolving customer preferences (see Figure 2). Going forward, competition is expected to increase as more OEMs enter, while third-party players will seek differentiation of their offerings vis-à-vis OEMs. Independent startups like Fair – who just acquired Uber’s leasing portfolio – operate via dealerships to optimize their inventory utilization and offer consumers an OEM-agnostic service, which can be a differentiated advantage. Flexdrive – a JV between Cox Automotive and Holman Enterprises, a large dealer group – is an independent player that can leverage existing dealership relationships through Cox to drive adoption. YoYo offers a unique business model variation by charging for utilization on a per mile basis, rather than time-centric model. Alternatively, rental car companies can also compete by extending from their current operating models, while leveraging their competencies in fleet management and existing national fleet presence to create a competitive advantage vis-à-vis OEMs. Ultimately, the range of entrants, OEM and non-OEM alike, and the undercurrents fueling change across the mobility landscape contribute to an exciting future for consumers and their automotive purchase, lease, or subscription decision. A Bird in Hand is Worth Two in the Bush: In scaling a vehicle subscription offering, how will OEMs leverage their established dealership channel and how do they deal with the risk of cannibalizing new car sales and aggravating their dealer network? Rental Car Competition: How will rental car companies – both incumbent and new entrant – respond to this competitive threat to their business model? The Lurking Uber Threat: Will ride sharing / car sharing companies try to enter this space with a competing business model, and if so, how can they differentiate themselves vis-à-vis competitors? A Stepping Stone to Future Mobility: Are there incremental business models unlocked through development of fleet management capabilities by OEMs which can drive monetization / utilization optionality?